Nobody wants a newly planted plant to die within the first month. That plant should last as long as it is designed to. 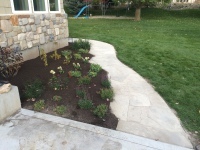 Proper installation practices need to be integrated into the process of establishing your dream yard. We can do that for you. From sod to garden flowers to trees, we can get the right plant in the right spot to make your dream yard come to life. To properly give you an estimate on what it will cost for an installation, we are going to have to come out and evaluate your yard and see what it is going to take to do such. There is too big of a range to state. Some jobs take more time than others.